This is a tough one, as I’m not sure if I liked it because it was good or because I somehow related it to it or, if its even possible, I didn’t like it. I have mixed opinions so the defining factor would be its “pull”, which to be frank began waning as I went further into the story. Growing up, passing the age milestones, is harder on some people than others. To me it started when I turned 12 and began dreading becoming a “teenager” and I was notorious for my almost-meltdown when big 3 oh was approaching. Now I’m 35 and the fast paced flipping of the calendar is beginning to make me nervous again, so you can imagine why the title, turning forty, had its pull on me. When Matt starts the count down for his 40th birthday, he also spirals into what looks like his lowest point in life ever. He quits his job, loses his wife, loses his house, and has to move from London to his hometown of Birmingham and move in with his parents as he sorts out what his next move is. It could happen to anyone at any age, and as he embarks on his journey of deciding what to do with the tattering remains of his life his perspective on the difference between turning 30 and turning 40 is quite obvious and, to be frank, raw. At 30 you can pull of looking/feeling/acting/dressing like a 20ish person while being in a more financially secure and wisely sophisticated level, however, turning 40 is different. Its like a looming deadline of getting your act together one last time or else and that you may still look good but, whether you like it or not, you are not 20 anymore -or even close-. 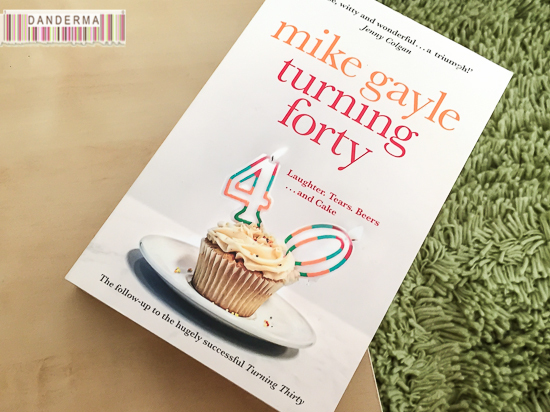 There is a quote in the book that summed up almost everything that should have been said when turning 40, and it is quite frankly what I liked most about the book “If you haven’t got your life sorted at forty, no one,not even your own mum, is going to hand you a medal and say well done. Because the universal truth of getting older is obvious. If you are a lose at forty you will be a loser for life.” Well said, well said indeed. However, you’d think that Matt, a 39-years-old successful IT professional who have seen the world and lived abroad would be able to make better choices and not jump from one hasty relationship to the other, making erratic decisions on his way and plummeting even lower as the clock ticks. It really grated on my nerves and made me feel hopeless. I don’t even know what the ending is, I read it of course but I’m not sure what to make of it, I was too bored by the end of the book with Matt to care. Should you read it? Well, its not a bad book and there are many quotes like the one above that made very much sense and provided a moment of reality check that you need to sort through your acceptance of the process of growing old despite the many frustrating events that occur.